I have to admit, I was rather skeptical about Final Fantasy Explorers when I first heard the game's description, but after hearing the game director's initial pitch... I'm actually even more skeptical. Final Fantasy Explorers is described as an action RPG with mutli-player capabilities. Players band in parties of up to four characters and fight familiar Final Fantasy monsters and summons. The game takes place in the land of Amostera where crystal gatherers, known as Explorers, earn a living by undertaking various quests in the town of Libertas and going out to the various parts of the world. Initially, my skepticism radar started beeping when I noted that the game's mentioned features sounded very Monster Hunter-esque, while the descriptions themselves seemed to be trying very hard not to sound like Monster Hunter. The multi-player, the battling large boss-like summon monsters, the central town where players get quests, the various locations like fields and volcanoes... It was hard not to notice similarities. Then came the developer interview in the latest issue of Weekly Famitsu. 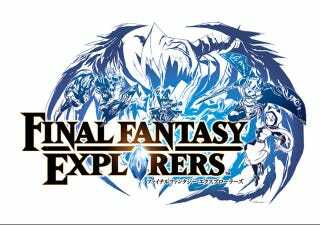 Asked what distinguishes Final Fantasy Explorers from the numerous other multi-player action games, director Atsushi Hashimoto stated, "Firstly, it's not simply an RPG, but it's an action RPG where players can roleplay with the jobs from the Final Fantasy series. Secondly, you can battle the famous historical summon monsters." Basically, the director of the game just said that the game's biggest appeal was that it was a Final Fantasy game. Now, granted, this isn't really a new practice for Square Enix. They've been riding on the success of the Final Fantasy brand and its iconic characters and creatures for quite some time now – often to very enjoyable results. It's not necessarily a bad thing, but in terms of building credibility, I'm going to need a little more than that. Hashimoto did go on to explain other features of the game, like the ability to capture and train monsters, and the combo capabilities. Hasihimoto even went on to say he didn't consider the game to be Final Fantasy-ish, but rather a toy chest with multiple different enjoyable elements contained within. Still, the almost deliberate avoidance of comparisons with Monster Hunter wasn't very reassuring. I suppose I am "optimistically skeptical" – if that's a thing – about the upcoming Final Fantasy Explorers. I'm skeptical, but I don't want to be. I'm fairly certain that Square Enix will offer an enjoyable game. I should add that while I would understand a developer's hesitation to want to be compared to a juggernaut like Monster Hunter, I personally have played many Monster Hunter "clones" that I've enjoyed quite thoroughly. The God Eater series, Phantasy Star Portable 2 Infinity, Square Enix's own Lord of Arcana and Lord of Apocalypse. I'm also looking quite forward to the release of Freedom Wars next week. Hopefully Final Fantasy Explorers will be equally fun, but as it stands, with what info I've been given, I can only warily hope. Final Fantasy Explorers is scheduled for release on the 3DS. No release date has been announced at this time.